The scientists of ISP focus their efforts on thorough investigation into physical phenomena mainly in semiconductor thin-film structures, especially surface and hetero-interface. The whole bulk of research work done at the Institute is eventually intended to develop modern informative technology,that is, to study creation, transduction and transmission of intelligence signals in microstructures. Of paramount importance is extending functional potentialities with concurrent shrinking microstucture dimensions. Considerable attention is given to developing the manufacturing process for fabrication of these microstructures and to working out experimental prototypes of production equipment. Much effort is made to elaborate non-destructive methods and devices for in situ control over the structures under development in the course of their fabrication. Considering the fact that present-day objects under study call for extensive knowledge, the research teams and laboratories of the Institute are most often multi-purpose collective bodies. It means that they join forces of physicists, chemists and technologists believing this to be the crucial condition for successful solution of any problem of modern semiconductor material science and instrument engineering.The researches the Institute is currently engaged in are aimed at developing the physical fundamentals of microelectronics, microphotoelectronics, acoustoelectronics and quantum electronics. Institute of Semiconductor Physics was founded in 1962 by academician A.V. Rzhanov. 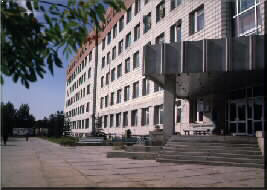 Institute of Semiconductor Physics is located in the heart of Siberia, near Novosibirsk city, in the place called Akademgorodok.